UK-based company Eli Chem Resins has harnessed the luminous magic of photoluminescence to create a non-toxic, glow-in-the-dark powder that can be mixed with resin to create glowing objects of just about any shape or size. Non-hazardous and non-radioactive, Eli Glow charges up after only 30 minutes of exposure to daylight and can glow for up to 10 hours in darkness. Rather than just reflecting light, this photoluminescent powder absorb radiant U.V. and then release it as ambient light, rather than just reflecting it. By day, the resin is pale and straw-colored, but will glow aquamarine, yellow-green, or cobalt blue at night. Eli Glow has an indefinite usable lifetime, and can be of great benefit for everything from artistic effects to safety features for highways, and doorway entrances, thus reducing the need for electric lighting. Eli Glow photoluminescent powder can be suspended in resin for a number of different applications. 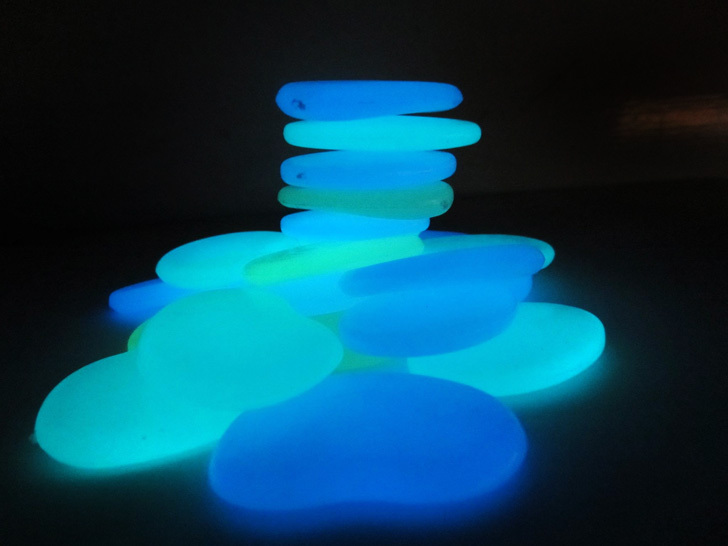 Imagine glowing stones along walkways and driveways: no electricity would be needed to illuminate them for safety. In darkness, the resin glows in the dark in either aquamarine, yellow-green, or cobalt blue. By day, Eli Glow resin is a milky straw hue, and draws U.V. energy from ambient light. From artistic displays to home building materials, this resin has countless applications.